West Indies have beaten Australia once in Twenty20 cricket: the final of the last edition of the World Twenty20 in 2016. On that occasion they successfully chased down 149, against all expectations. On Thursday, they looked a shadow of that side, collapsing to 71 all out as Australia won by a mammoth 71 runs. Ellyse Perry tore the heart out of the West Indies chase before it really got going, removing big gun Deandra Dottin and the No 4, Shemaine Campbelle, in successive overs as the defending champions finished the powerplay with three wickets down and 26 runs on the board, having played out two maidens. The ball to Dottin was a beauty, nipping back in to take out her leg stump. None of the team bar Stafanie Taylor could muster double figures; by the time the West Indies captain sliced a flighted delivery of Sophie Molineux straight to mid-off in the 11th over, West Indies were 44 for five and staring down the barrel. So it proved, their last five wickets falling for 27 runs. 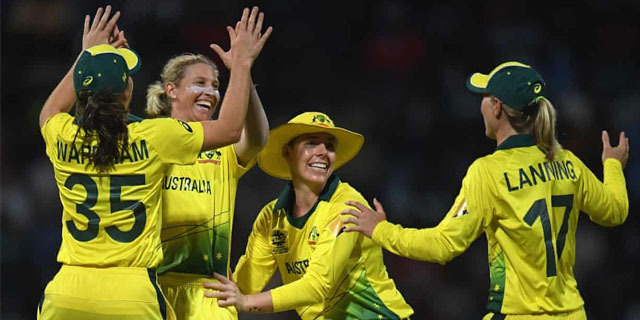 Earlier, it had once again been Alyssa Healy who formed the backbone of the Australia innings, hitting 48 from 38 balls, falling just short of a third tournament half-century. Rachael Haynes then led a late Australia surge, punishing the penultimate over for 17 runs as she finished unbeaten on 25. Dottin was the bowler at fault, getting the yips at just the wrong time for her side as she leaked three boundaries and two wides. It was a disappointing end to what had been a superb effort from the home side to peg back Australia for the majority of their innings. With 35 on the board after six overs, Australia played out their lowest powerplay total of the tournament, including just three boundaries. Healy lost her opening partner, Beth Mooney, early, as she popped up a simple catch to mid-off in the third over. Meg Lanning, promoted up the order ahead of Ashleigh Gardner, then shared a 51-run partnership with Healy. After being ruled fit to play an hour before the toss, the keeper, who was concussed in the match against India, pulled the second ball she faced for four through midwicket and sliced a hefty six over Shakera Selman’s head. She finally departed in the 12th over, failing to quite bring off a sweep shot and top-edging the ball into the hands of short fine leg. By contrast, the Australian captain, who scored a 39-ball 31, never looked quite secure at the crease. She survived two chances from successive deliveries in the ninth over when she was on 11. First she danced down the pitch to Hayley Matthews and ended up a gnat’s whisker away from being stumped, then was almost at the sharp end of a diving stop-and-throw from Dottin at point, just making her ground on both occasions. Dottin, introduced to the attack in the 17th over, finally sent her packing, with a ball that skidded back in and bowled the right-hander. For a few minutes she was the hero of the hour: it was short-lived. That disastrous over soon followed, silencing the heaving Antiguan crowd. They never quite woke up again. Australia, then, surge on to the final, where they will face England, who accounted for India in the following match. But for West Indies, their long-cherished dream of a second successive T20 title – this time in front of a home crowd – is over.